There is only a single copy of each static data item, rather than one copy for each instance of the class. When you have a static data item in a generic class, there is a single copy of that data item for each constructed type based on the generic type. A constructed type is a type declaration that is based on a generic type, providing arguments for the generic type’s type parameters. Assume that we define a PileOf<T> type that has a static NumInAllPiles field, incremented as part of an Add method. We reference the static field using the constructed class name and see that each constructed type has its own copy of the static data. Instance methods in a class can make use of any of the public or private static data that belongs to that class. (They can also make use of static data from other classes, provided that it is accessible). 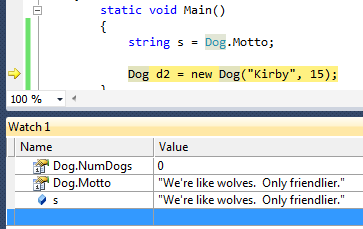 Instance methods in a class can access static data or call static methods. The instance method accesses static data or methods in the same way that other code does–by using the class name to qualify the data or method name. // Dump out my name and the universal Dog creed.